RIVERTON — A high school student knew intolerance existed in this town of roughly 11,000 long before a local radio host’s homophobic remarks thrust LGBTQ issues into the spotlight. Cheerleader Elisabeth Carey had always felt it was smarter to keep her secret — the one about liking girls — mostly to herself until she graduated. Who wants to make high school any harder? she said. 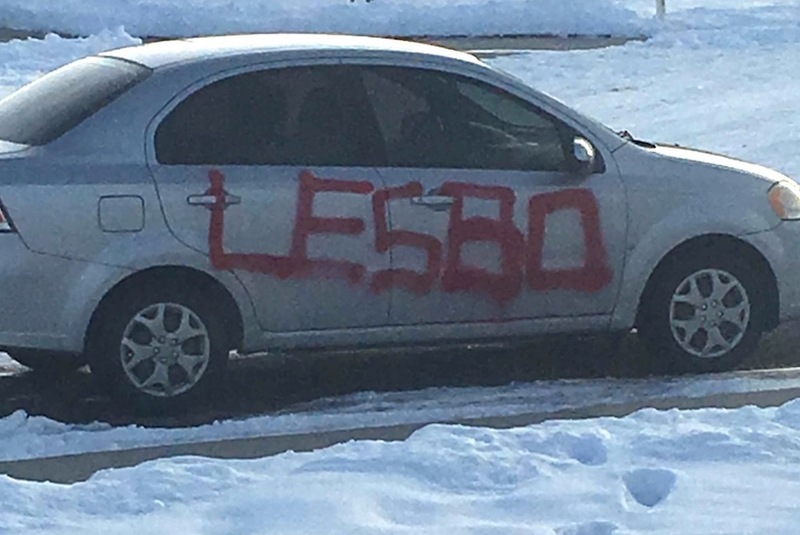 But she was ill equipped to deal with the consequences when someone spray-painted “LESBO” in large red letters across the passenger’s side of Carey’s car and let her drive the graffitti through town, unawares. Carey has bright eyes and a smile that hovers in person and breaks through in photographs — especially the ones taken with family members. WyoFile has given her a pseudonym to protect her privacy as a minor. A member of a Wind River Indian Reservation tribe, Carey belongs to a large multigenerational family and likes to go hunting with her father — a big man and a law enforcement officer. Horrible thing for people to do to this girl. Just horrible. 1. Horrible thing for people to do to this girl. Just horrible. 2. What a heartbreaking story. People's ignorance and bullying never ceases to amaze me. Of course Trump, and the GOP in general, have condoned this type of behavior and these bullies don't need any more reasons to act out. These people say they're tired of being politically correct. How about just being decent human beings? Apparently that's too difficult for them to handle as well. Don't these people realize the time and energy they're wasting on their hate? They only have to accept once. They keep hating and bullying forever. That robs you of time and energy that could be spent doing other, constructive things. Their hate begins to define who they are, and soon they have no room for anything but hate. I'm glad Elisabeth is getting through this in a positive way. There will always be scar tissue, but scar tissue is tough, and makes subsequent attacks more difficult to harm you. It's nice to know that many in the community rallied around her, and made her feel safe an welcomed. To the asswipes who harassed Elisabeth unmercifully, you're going to be very busy carrying around your hate wherever you go. I hope the weight becomes unbearable and you stumble and fall because of it.